After a few weeks of trying to use Google Wave by myself (doesn’t seem useful without someone to Wave with you ), I finally engaged in my first realtime chat. 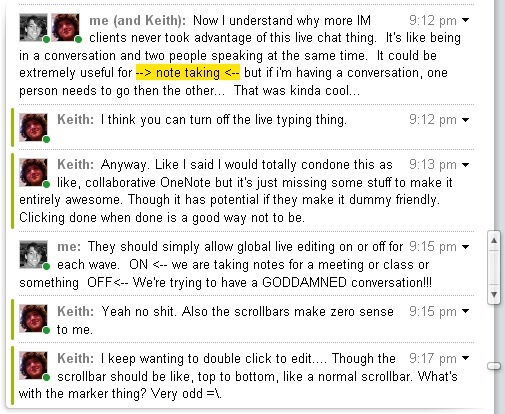 First thoughts… Google Wave absolutely cannot replace IM. Think about talking someone face to face in real life. Now imagine that both of you are trying to talk to each other whilst listening to the other person AND responding to what they’re saying. It’s impossible in real life thus is extremely frustrating online. However, I do see the extreme usefulness of being able to collaboratively note take with a group of people at a meeting/class/ conference. But again, two people in a chat was frustrating. Any more than that working on one doc would be pure havoc! I don’t think this tool will ever hit the mainstream, but people will find its useful niche and make it shine. This entry was posted in Uncategorized and tagged google wave, review. Bookmark the permalink. ← I love Chipolte’s iPhone app!